Guante: Summer So Far: 8035 fest, CONvergence, the Roots, Janelle Monae, Canvas, etc. Summer So Far: 8035 fest, CONvergence, the Roots, Janelle Monae, Canvas, etc. 1. Yeah, expect a Guante & Big Cats! mixtape this summer. Mixtape in the sense that it's some new songs, some old songs and some live songs, though all the music is original. Details soon-- but let me just say, with complete humility, that's it the best mixtape anyone has ever done, ever. 2. Lots of great shows. Just finished a busy weekend with a show in Chicago with Melissa Czarnik, a Milwaukee rapper who is definitely worth a listen. I won the geek slam at the massive CONvergence sci-fi convention, despite being very, very cool. 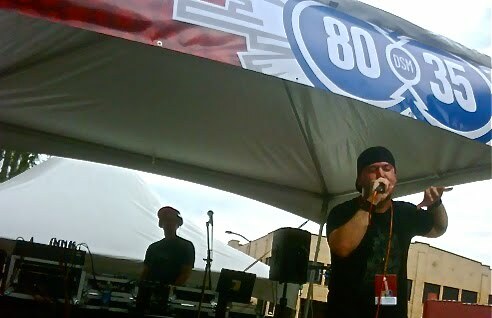 Then me and Big Cats went down to Des Moines for the 8035 festival, a huge music festival featuring Spoon, Yo La Tengo, Modest Mouse, Psalm One and many more. It was a beautiful day, until it spontaneously started raining during our set. But that's my fault. At least the crowd didn't leave, which was great. Big ups to Maxilla Blue for the hookup. 3. Canvas, the teen center where I serve as arts coordinator, is doing some really cool things. We just had a Hip Hop Against Homophobia concert (volume five, I think) featuring Mictlan from Doomtree, Heidi Barton Stink, Kaoz and me. Lots of fun. Also had a great community organizing workshop with Melvin Carter and a screening of Slingshot Hip Hop. That's all in addition to the weekly writing circle, drawing studio and dance ciphers. If you know teens in the Twin Cities, send 'em our way. More good things happening. 4. National Poetry Slam organizing and practicing is going great. We have a killer team this year, and are looking to repeat on our home turf. I'm especially exciting about the side events, and how we'll be plugging in local poets with national poets to host and run things. It'll be a beautiful mix. Side events include: LGBTQ, women's, Black, Latino/Indigenous, APIA, grief & remembrance, parent poems, group pieces, hip hop showcase, erotica slam, youth slam, rookie slam, limerick battle, haiku battle and more, plus workshops on writing, performing, activism and education. Full schedule will be up soon. 5. I'm kicking off a big project dealing with activism in the Twin Cities. The first phase of it is simply compiling a list of organizations who are doing good work. Do you know of any? 6. Rodrigo Sanchez-Chavarria's chapbook release show at the Loft has really pushed me to try to finish up my new book, which will be a companion piece to my one-man spoken-word show, The Fist that Lives in Your Neck. More info soon, hopefully. Will also be touring in October! Details TBA. 7. Labelmate and friend SEE MORE PERSPECTIVE has a new instrumental single, the harbinger of doom heralding the arrival of his new beat-tape, Breaks in the Clouds. 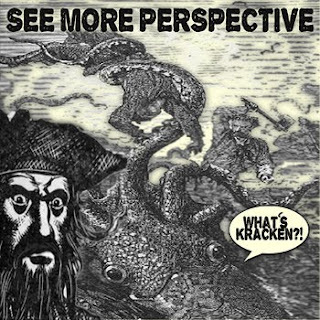 The song is called What's Kraken, and has some really great album artwork. Janelle Monae: The ArchAndroid (Four Takes at Reviler.org with Mayda, Dessa and Jon Behm): I gave it a glowing review, but haven't been coming back to it as much as I thought I would. This might end up being one of those albums I respect more than I enjoy. The Roots: How I Got Over (Four Takes at Reviler.org with Sean McPherson, Ali Elabbady and Jon Behm): This one has been growing on me, though I liked it well enough at first listen. I'd maybe rate it a little higher than I did at first. Kristoff Krane: Hunting for Father: a review I posted here a while ago. In case you missed it. I know of and work with a great group of activists in the Twin Cities! We're part of a program called The Summer of Solutions, and you should check out our website (even though it is kind of out-of-date) and our blog (which is much more up-to-date). We are trying to put on a concert in late July to raise money and spread the word about what we're doing. Feel free to get in touch with me if you want any more information. Was great seeing you guys represent MSP at 80-35 earlier this month. 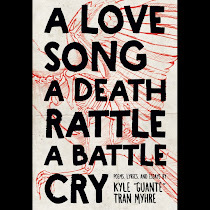 -G.
If your chapbook is done in time you should think about getting a table at the Twin Cities Book Festival (10/16). Lots of poetry readers there. Have you heard of Chastity Brown?